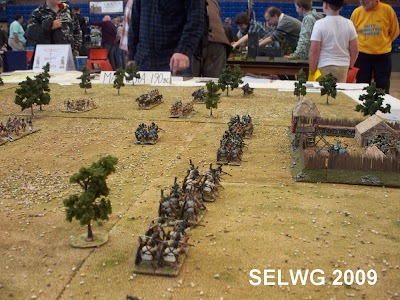 It was a pity SELWG and the Open clashed ... the Crystal Palace event has been missing from the calendar for a couple of years due to refurbishments, and has made a welcome return. Maybe next year. And, of course, a warm welcome to all those new members. Don't forget to drop by at one of the shows and have a chat. 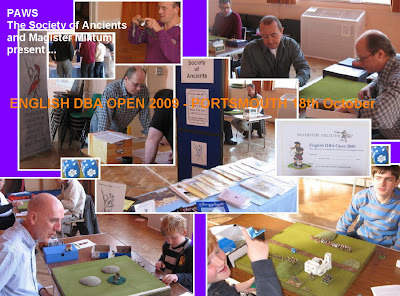 Mid October and Portsmouth beckons - host of the annual 'English DBA Open' sponsored by the Society of Ancients and Magister Militum. Thanks to the PAWS club for running it and to MMs for adding in a nice DBA army prize. My basic premise that no-one else would take a Christian Nubian was wrong (sorry Duncan - I very nearly took Later Pre-Islamic Arab ... perhaps we should collude next time ...)... I fought one in my second game. 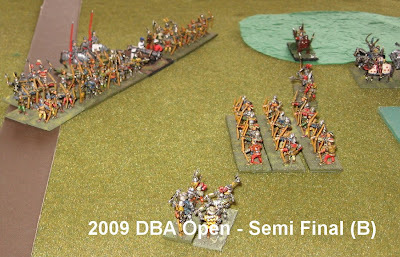 My impression was this year there was a bit more infantry around ... but a good mix of army types none the less. I fought against Chinese, Bospran, Palmyran and Egyptians as well as the other Christian Nubian. The army is Aggression 1, and aside from the civil war, attacked twice and defended twice. 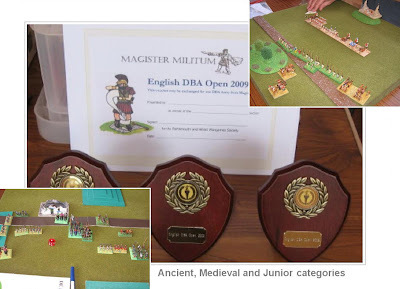 We played off in two pools, Medieval and Ancient, with the pool winners plus next two highest scoring players going into a semi final (and the two highest scoring Juniors going into a Junior final also) ... Courtesy of a very generous Richard Pulley (whose Palmyrans forgot to put their armour on), I very nearly made it to the semis ... (and Richard faded out of them). Aside from that rather dicey game (in which Richard played well enough to leave me no chances other than lucky longshots with bowmen ... I need say no more, as four of those will win a game!) ... all were close and challenging. 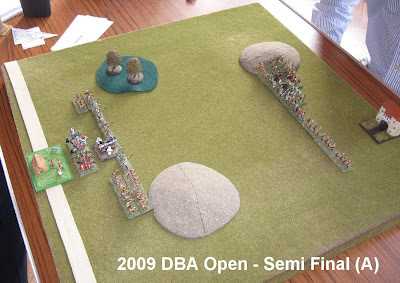 My game against Robert Dowling in particular saw me kill his general early on, but not get ahead on elements till taking his, six against my five. Now that is close. 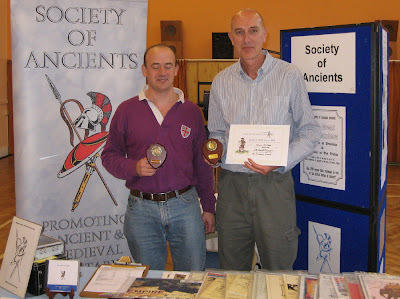 The semis and final were played with a matched pair provided by the organisers. 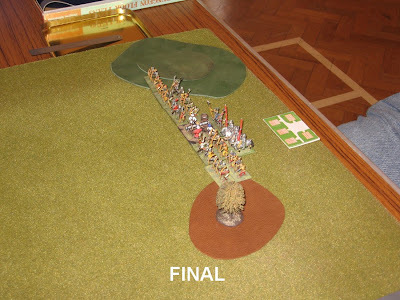 In this case, Wars of the Roses with all options (and the players could pick their preferred variant before the matches started). 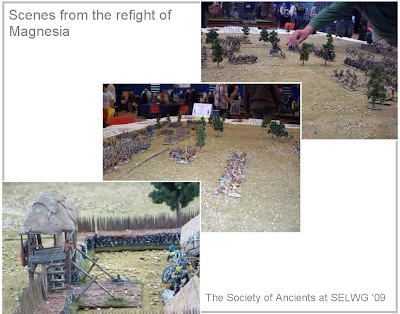 Refreshingly, all four armies ended up different (and hopefully the players will contribute their reflections on the choices they made to a report for a future issue of Slingshot)..
and a write up is promised for a future Slingshot. 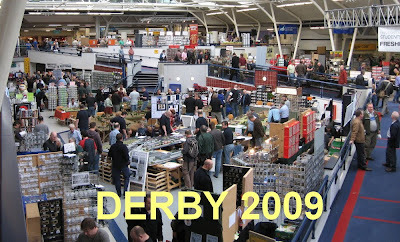 Many thanks to the Derby organisers for their good offices. We were in one of the further corners last year, and a little short - especially on the Sunday - of the passing traffic necessary to make participation games work. 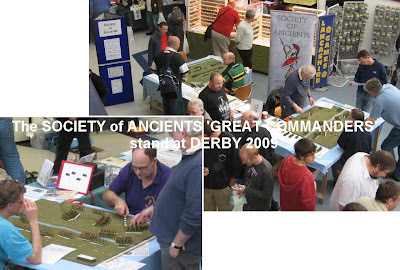 This year Graham offered to reprise the 'double game' offer of The Great Commanders which we ran at Milton Keynes earlier in the year ... but on the proviso that we had a more suitable pitch. The results were a bit of a swing from the Milton Keynes outing. 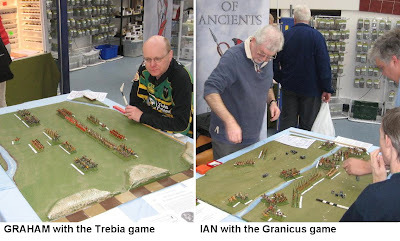 Without Will bringing his uncompromising determination to the Roman cause, Hannibal reasserted his customary control over the Trebia scenario. Alexander, however, was no longer just walking over the Persians at the Granicus. 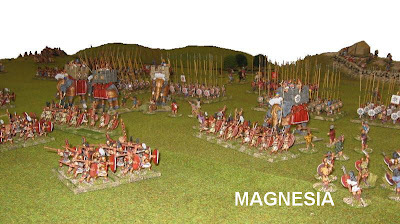 Whereas in the MK version, the somewhat flimsy cavalry force was backed by a unit of hoplites and a unit of foot skirmishers, in the Derby line up, both units were hoplites. 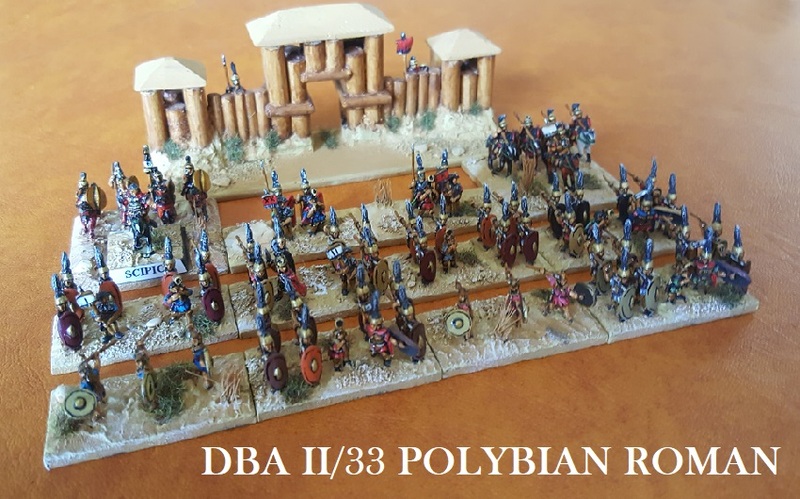 Facing a Macedonian phalanx, this really did seem to bolster up the Persians ... meaning attempts to overwhelm the enemy flanks did not automatically entail allowing the Phalanx to walk off the board in the centre (which is fatal in AMW). Well, the results speak for themselves ... 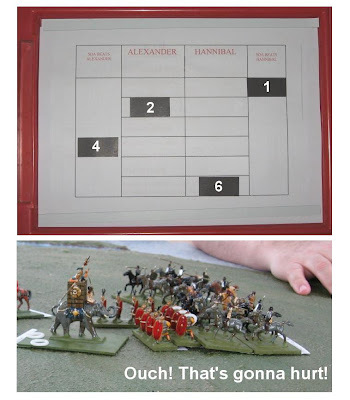 The (experienced) SoA presenter team beat Alexander 4-2 at Granicus, but lost 6-1 to Hannibal (and his elephant, if that isn't giving the game away ...).. 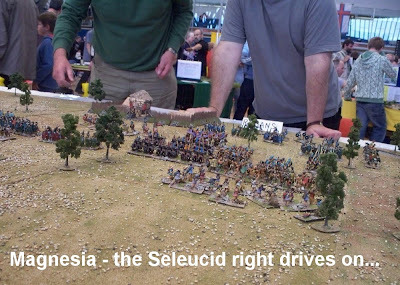 I quite like these Peninsula Napoleonics as well. 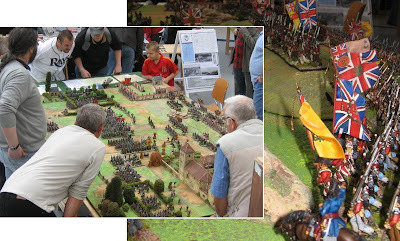 Again, no fan of the sprawling Nappy 'static' games we see so often, this time the big one was a Borodino in 6mm (the kind of scale you might well actually use for refighting Borodino! ) 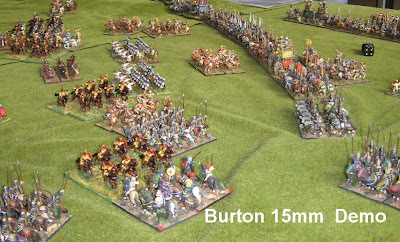 and the compact and densely filled Peninsula game wasn't too overblown and looked great (the sort of Divisional scaled game you might actually play in 28mm ...)... An uncharacteristic thumbs up from me. The Leeds club very big 'Raid on St Nazaire' which I had to go up to the balcony level to get a good look at (get it all into the camera frame). I wonder how it worked. Maybe it'll be at their home show, Fiasco, at the end of the month. Come and see as at a show.